NEW Latest Flash! Pro3 School Version Release! We know that using good flashcards is vital in teaching and improving speech, language and communication. However, a common mistake is to get only a limited range with only one instance of each image. As any teacher will tell you, you must have many different variations of each picture so your child can generalize what is being taught out in the real world. Not only does the New Flash! Pro3 (now on USB) have 15,000 printable flashcards in over 80 categories with different instances of each image, you can also view, resize and print (with or without labels) your own digital camera pictures easily, giving you a limitless teaching resource. Categories of images on the Flash! Pro3 include: Adjectives, Alphabet, Amusement, Appliances, Arts & Ornaments, Bathroom Objects, Bedroom Objects, Body profiles, Building & Structures, Colors, Costumes, Counting, Computer items, Cutlery, Fitness, Flags of the World (all 221 flags), Fractions, Furniture, Games, Garden & Plants, Genders & People, Household objects, Kindergarten activities and items, Kitchen & Cooking items, Locations, Maps, Money, Multiple Discrimination, Musical Instruments, Nature, Numbers, Numerical Association, Occasions, Occupations, Park & Playground, Patterns, Personal Items, Prepositions, Rooms, Safe & Unsafe, School items, Sequences, Shapes, Shapes 3D, Sports, Stationery, Time, TV characters, Weather, What's missing from this picture, What's wrong with this picture, Workshop and Tools. Limited Offer : Order the Flash! Pro3 today and get the ABA Worksheets & Sound Tutor included for FREE!! Without good language skills, a child is left alone or even picked on by other children. All children have the potential to learn even from a very early age. They just need a helping hand. We produce multimedia software to develop a child's speech, language, communication and social skills. Our easy-to-use software has helped many thousands of children worldwide. It is used by mainstream schools, special schools, speech and language professionals and parents working at home with their children. The Flash! Pro3 (on USB) that runs on any version of Windows including Vista, XP and Windows 7, 8, 10 or higher has a huge collection of over 15,000 color photographic images in 80 categories (click above on "Samples") that you can preview on your PC and print to teach speech, language and communication to children of all ages. 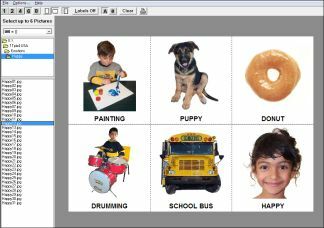 You can even view, resize and print your own digital camera images with or without labels to use as flashcards. Order now and get the ABA Worksheets and Sound Tutor included for FREE on the USB. What other products do we have? Click above on the "Products" tab for more details on the other software currently available. Yes. We accept Paypal payments as well as Mastercard & Visa. To order online, click now on the above "Products" tab. Do we have any special offers on at the moment? Yes. Order the Flash! Pro3 (on USB) today and get the ABA Worksheeets for FREE! The ABA Worksheets has over 2000 printable exercise sheets in Powerpoint that you can print and use to teach your child. Also included is the Sound Tutor with dozens of sounds to teach your child. My son was diagnosed with Autism at the age of 2 years and 3 months. He had poor speech and was a good way behind the other children of his age. A month later he was on intensive one-on-one home-based therapy. By five, he was in a regular mainstream school, totally indistinguishable from his peers. Click here or on the "Autism" tab above to read what I have learned about the condition and how I used my home computer to help him. We'll get back to you within 2 working days.